As a company, we are always on the lookout for new and exciting technical products. Some people know us for the cool gear we sell but, truth be told, we’re pretty geeky here at Motolegends. What we really like is the gear that works on the bike. We love working with people and companies that go the extra mile to produce superior products; pieces that will keep rider drier, more comfortable, cooler, warmer and, most importantly, safer. It’s why we’re so into laminated clothing, single-layer jeans and flip-lid helmets. Well recently we came across a glove that is so much better than anything we’ve ever tried on before that we found ourselves salivating at the prospect of telling our customers about them. Basically, the gloves are made specifically and uniquely for the Police. I say ‘uniquely’, but Motolegends has been given dispensation to act as the exclusive retail seller. There are two gloves in the range. There’s a summer glove with an Outlast lining to help you stay cool. And there’s a more wintry version with a lightish thermal lining and a waterproof membrane. We know the man who designed these gloves, and we’ve spent many hours with him getting to know them, and understanding why they’re almost certainly the best quality and most protective road-riding gloves you’ll ever ride in. 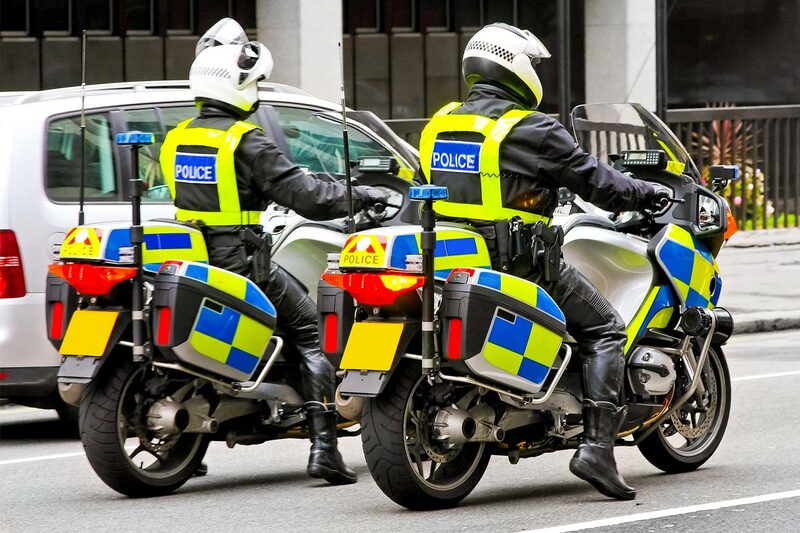 Which is what you might expect of a glove that has been developed expressly for the Police, and which has been produced with input from a number of the leading forces. Let’s start off with the summer version, which seems the most pertinent right now. The Summer Police motorcycle glove. Click on image to buy. The chassis of the glove is a 0.9mm cowhide. But what makes the glove so protective is the extensive use of secondary layers of leather. There’s an additional layer on the palm and on each finger. The second layer along the outer edge of the glove is particularly comprehensive, and incorporates three individual TPR sliders. But the way the gloves have been designed, the extra leather panels aren’t just there for added abrasion resistance. The leather panels have been designed to cover all the exposed seams where bursting might be possible in an accident. You’ll see how intricately this is done on the fingers where specially-shaped tabs overlap the seams. In addition to the sliders on the outside of the little finger, there are hard TPR protectors on all the other fingers and thumb. And you get a hard protector for the knuckles that is placed over an EVA foam panel, to help absorb impact and increase comfort. On the palm there’s a hard scaphoid protector, as well as a cushioned protector at the base of the thumb. On the palm and fingertips, you’ll also find a layer of what Pittards calls digi-print leather. Clearly this layer delivers added protection, but the patterning on these areas is to allow better feel on the controls. On the upper side of the glove, there’s another hard protector on the outside of the wrist, and another EVA foam insert to absorb the energy of an impact. As this is the summer version of the glove, some of the leather panels are perforated; in particular on the fingers and thumb, but also at the cuff. Now we sometimes talk about Outlast as a way of keeping a rider warm, but in the racing world, for example, Outlast is often employed to keep a rider cool. And that’s because it takes heat from the skin and stores it in paraffin molecules in the membrane. And that’s why you’ll find Outlast in these Police gloves. If you put the glove on when you’re hot, the inner of the glove will absorb the heat and, within a couple of minutes, they’ll feel significantly cooler. The wrist closes and adjusts by means of a Velcro strap that is protected with a leather tab. But the top of the wrist is also elasticated for a permanently snug fit. July has seen some amazing weather, and so we’re not suggesting that this is the perfect vented or air-flow glove; it emphatically is not. 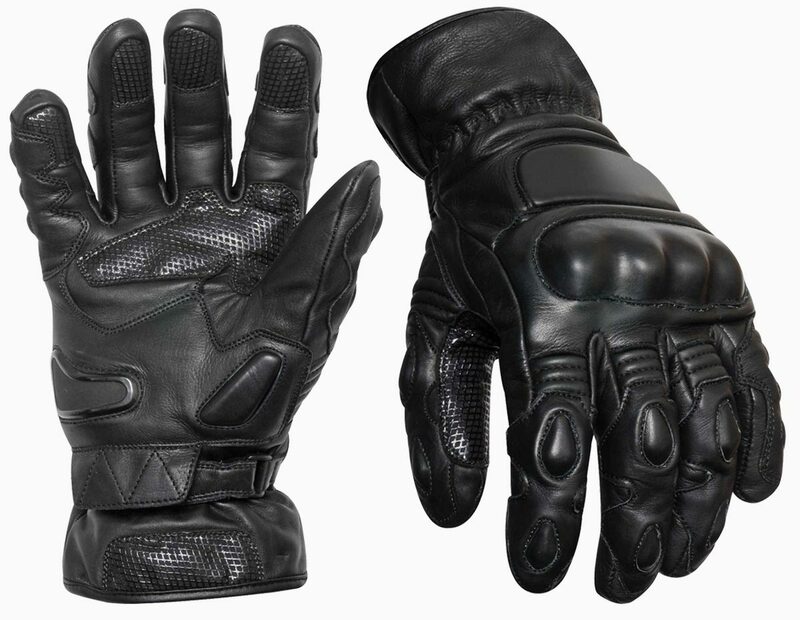 But if you want a summer-weight glove that you can wear on all but the very hottest days, a glove that delivers unmatchable levels of safety and protection, combined with supreme comfort, then we think this Police glove has no peer. 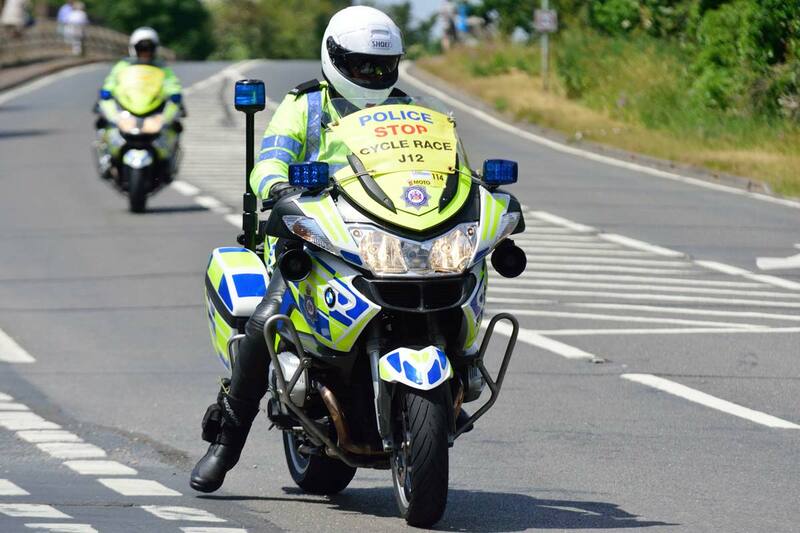 But for riding in weather that is more changeable, there’s another Police glove that we’re calling the winter glove, although, in truth, it’s more spring and autumn in our opinion than proper winter in its scope. In most respects, the two gloves are pretty identical; certainly insofar as materials and construction are concerned. Put them side-by-side, and the only external differentiator will be the perforations on the high-season version. It is largely on the inside that the differences are to be found. Perhaps the key difference is that the winter model has a waterproof membrane. On the Police glove the waterproofing comes from a highly regarded membrane called Hipora. It’s not GoreTex, but it does exactly the same job. Now we’ve often opined that a leather glove with a waterproof membrane is not ideal, and it is true to say that if staying dry is the major objective, then a textile glove is the what’s called for. But a membrane will still keep the water out. The real problem is that, in heavy rain, the glove will ‘wet out’ and, even if your hands actually stay dry, they will still feel cold and wet. But the winter version of the Police glove will certainly keep your hands dryer than will a glove that does not have a membrane. Importantly, because a waterproof membrane is also windproof, the winter glove will feel much warmer than the summer glove when you’re riding on a cold day. The winter Police glove also has a warming, fleecy liner made by a company called Tendra. It’s soft to the touch, and feels nice and cosy. But we would certainly not go as far as to suggest that this is a full-on winter glove, whatever the Police think. The glove has no thermal insulation, per se. Undoubtedly, the winter version will feel warmer than the summer version, but we see this as a March to October glove; and even then probably only if you’ve got heated grips. If you do the big distances in mid-winter, this is not the glove for the job. You’ll need something more substantial. The Winter Police motorcycle glove. Click on image to buy. In conclusion, we love both these gloves. They do different jobs, but their competencies over-lap, so you’d probably not want or need both. The winter glove you could wear for eight or nine or nine months of the year; and it would have to be really hot for them to be uncomfortable. But if the temperatures hit the high twenties, and if you do a lot of town riding, the summer glove will hit the spot more neatly. The gloves are now in stock. 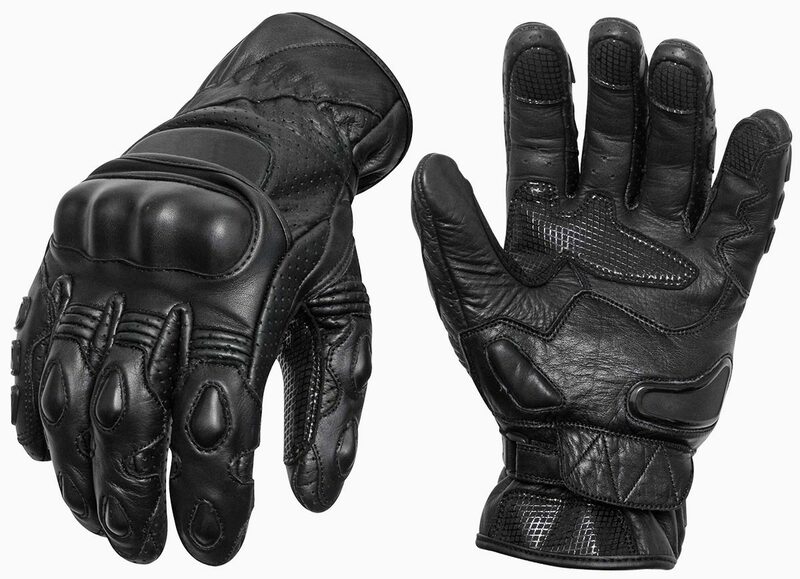 The summer Police glove (ML026) costs £129.99; the winter version (ML027) costs £149.99. That’s not cheap, of course, but if these gloves were produced by someone like Rukka, you’d be paying much more; much, much more. And so, for what they are, we think they represent good value. Order online or, better still, come and see us in Guildford. Once you’ve tried a pair on, we think you’ll agree that nothing comes close.